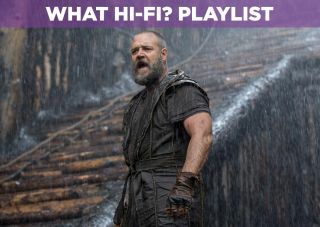 Noah – film review | What Hi-Fi? Where do you start with a film like Darren Aronofsky's Noah? In an era of franchises designed to be instant hits, a film with a vision as bold as this – one that will inspire some debate over its themes and artistic choices – does not turn up at the multiplex too often. Perhaps it’s for that reason alone Noah feels like one of the more significant films of the year so far. Loosely based on the story that we all grew up with, but cribbing from a number of different sources and scriptures, Noah is a hefty, turbulent piece of cinema that lingers after you've watched it; even if you're unsure of whether you enjoyed it or not. Noah (Russell Crowe) is tasked with an important mission: build an ark to hold the animals of this world in anticipation of the impending flood that will lay waste to the earth. It's in the execution where Noah veers away from more traditional versions of the tale. The earth is barren, men are ruthless murderers and there are angels! These fallen angels (called Watchers) were cast from above by the Creator (not referred to as God) and left on earth as molten, rocky husks that resemble golems from Jewish folklore. If you're expecting something in the vein of Cecil B. DeMille's films, then you've probably not seen Aronofsky's previous work. This is the Bible seen through the lens of a Lord of the Rings or Game of Thrones by way of Mad Max. And as weird and ridiculous as that sounds, it just about works in a film that tonally see-saws from one extreme to another; its scale expanding and contracting at will. Whether it is the gorgeous grace notes that would make David Fincher feel fuzzy, to moments of grizzly violence and horror, Aronofsky's imagination fills the screen and seems unconcerned about whether you 'enjoy' it or not. In one instance Noah recounts the beginning of creation and the earth (respecting Darwin's theory of evolution) all the way to man’s propensity for destruction in an absorbing sequence. It pulses with ideas and visuals that excoriate and yet are almost balletic. It's a rough looking film both in terms of its visuals and construction – as if every thought Aronofsky has had on the subject has been poured out and reassembled with crude instruments on screen. Speaking of crude, Ray Winstone's Tubal-Cain (briefly mentioned in the Hebrew Bible) is introduced as a counter-point to Noah and is emblematic of the film’s strongest and weakest points. With Noah’s journey being the main focus the film has a tendency to render many of its supporting characters in rather simplistic, opposing ways to him. There's not much depth to be found in Winstone's performance and perhaps that's the point, but his presence does raise an interesting question in terms of the purpose of humanity. What purpose does man have if not to have dominion over the earth? Aronofsky clearly shows which side he (and therefore we) are on but it raises an interesting point. There's so much to discuss about Noah, good and bad, that this review couldn't possibly go into all that detail. We haven't even discussed the actors. Crowe brings a world-weariness and conviction to his rendition of Noah. He’s charged with securing a new world but the way Crowe, and the script by Aronofsky and co-writer Ari Handel deal with it, it’s depicted as a tremendous burden that weighs Noah down as he contemplates damming all of humanity to a watery grave. The last 20 minutes show him dealing with survivor's guilt (and getting drunk, a lot). Other characters are etched with less depth than Crowe’s. Jennifer Connelly's Nameeh (Noah's wife) gamely battles with the emotional content, getting her one scene to demonstrate her abilities that’s a little bit predictable but effective nonetheless. Emma Watson, Logan Lerman and Douglas Booth are all fine in their roles but never escape the feeling that they're merely ciphers for themes rather than fully fleshed out characters.Anthony Hopkins enlivens proceedings with an eccentric turn as Noah's grandfather Methuselah, but you may be put off by his constant mutterings about berries. Yes, berries. Visually it looks earthy and rustic with Matthew Libatique's cinematography (Iron Man, Black Swan) grading this world in autumnal hues, helped by shooting on location in Iceland. This world has a rough, worn-in look, a world that's on its last legs and it'll be interesting to see how it stands up on DVD and Blu-ray on the small screen. Long-time collaborator Clint Mansell provides a brooding, ominous score that weighs oppressively over the action. Noah may not be a film that you enjoy but it's one you come to respect. It challenges, it's uncompromising, it mixes the profound with the ridiculous, overall it feels like it's constantly grappling and debating with itself. Thinking about its themes may be more entertaining the film itself. This is not the kind of film-making you see too often, a fascinating if hard to love film that kept us intrigued with its ideas and visuals throughout. It won't be for everyone, but is it worth a look? We'd say so.